EzFlow Gel It! Blush It! Blush It! A perfect shade of pale - Soft Pink Gel. Blush it! represents a delicate shade of pink and covers slight discoloration of the nail. It is suitable for the template technique, and tip and natural nail overlays. EzFlow Gel It! Clear It! Clear It! A perfect shade of pale - Clear Gel. Clear It! represents a completely transparent gel and is suitable for the template technique and tip/natural nail overlays. EzFlow Gel It! Cover It! Cover it! is a make-up gel for nail extensions and nail bed covers. It is suitable for the template technique, and tip/natural nail overlays. EzFlow Gel It! Edge It! Edge It! is a milky white for natural looking free edge extensions. 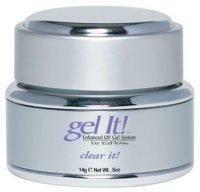 EzFlow Gel It! French It! French It! French is a pure white and is suitable for the template technique, and tip/natural nail overlays. EzFlow Gel It! Pink It! Pink It! 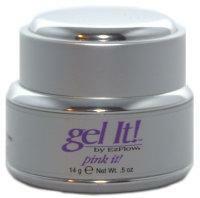 A perfect shade of intense pink..
EzFlow Gel It! White It! White It! is a soft white French and is suitable for the template technique, and tip/natural nail overlays. Gel Polish creates beautiful long lasting color in one coat, without smudging or waiting for polish to dry. Gel Polish absolutely will not chip or peel. Cleanse It! solution pampers cuticles and surrounding skin with deeply nourishing Vitamin E as gooey, gummy residue melts away like magic. This gentle, fast-working solvent leaves your gels absolutely immaculate with no damage to enhancements. Every manicure’s a masterpiece with our Gel It! 907 sculpting brush. We have used sable hair for its flexibility, resilience and unique ability to control, carry and distribute product evenly to your client’s nails. With proper care, this brush will be an indispensable tool for a very long time.